Our office received this notice. I don't know anything more, but it's a heads-up and means we need to be paying attention. The original notice says to expect waves about 1:23 PM local time. 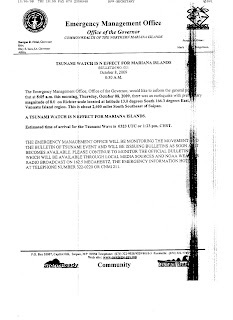 But this new bulletin from the Pacific Tsunami Warning Center cancels that alert. You can follow up for more information at the PTWC Pacific region site.